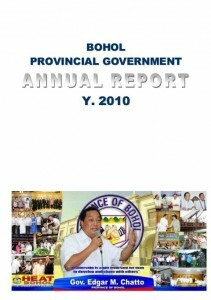 The Annual Report of CY 2010 highlights the achievements in relation to the HEAT Bohol Development Agenda, the over-arching development framework of the Provincial Government, and is a consolidation of the achievements of the past administration and the Chatto-Lim administration. Built on top of the accomplishments of the previous administration, some programs and projects are even enhanced to ensure the continuity of worthy programs, projects and activities so as to optimize the use of scarce government resources. This Annual Report, follows the format prescribed by the Department of Interior and Local Government (DILG), consisting of three major parts: The State of Performance, the State of Productivity, and the State of Local Governance Report. Part II of this Annual Report hews to the widely-accepted sectoral classification of sectors in development, as follows: Social Development, Economic Development, Environmental Management, Development Administration, and Infrastructure Development. As we push forward with our development plan for 2011, we shall take note of areas for further improvement from our accomplishments for CY 2010, so we can perform with more efficiency, effectiveness and economy. 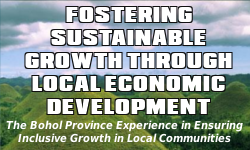 I shall continue to count upon the support and cooperation of stakeholders across all sectors of Bohol, in our concept of Shared Leadership, to sustain and even surpass the 2010 accomplishments.